Digambar Jain temple is located near the Red Fort in the Chandni Chowk area is one of the oldest Jain temples in Delhi. Built in 1658 AD, the temple is dedicated to the 23rd Tirthankara, Parashvanath. Built completely with red sandstone, this scarlet structure holds huge religious importance for the people following Jainism. 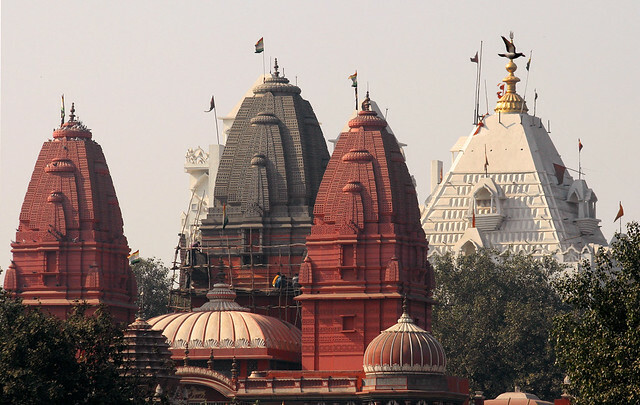 Digambar Jain temple is popularly known as Lal Mandir. The temple architecture boasts of very intricate carvings, and detailed paintwork in the chambers that surround the main temple. Digambar Jain Temple also houses the idols of Mahavira and people from all over the country come and pay their devotions to the tirthankaras in the form of sweets, fruits, rice, grains, etc. There is a peaceful aura about the place and every corner beams of spiritual serenity. There is an avian veterinary hospital behind the main shrine and a bookstore as well, where there’s a huge range of Jain literature available, apart from other souvenirs. Visitors are required to take off their shoes and all leather accessories before entering the temple complex. In spite of being located in one of the most chaotic parts of the city, the Digambar Jain temple is the epitome of peace, purity and devotion.